What better way to use leftover chicken than in this recipe! Absolutely one of my new favorites and a flavorful twist on a classic recipe! The traditional version calls for “non-foods” such as cream of mushroom soup, processed cheese and conventional pasta which we all know is NO good for you! Try this recipe for all the flavor but using all real ingredients! This recipe is full of flavor and is really easy to make. Use leftover chicken and a pre-cooked spaghetti squash and this meal can come together in less than 20 minutes! I also use chopped frozen vegetables such as onions and bell pepper to cut down on my prep time even more! Cook the spaghetti squash (in a slow cooker) over the weekend and have it ready for whenever you need it for the week. The recipe reheats well and I even froze the leftovers and I am looking forward to eating it on a lazy day! *For a more intense flavored chicken stock, add 2 cups of bone broth to a pot and reduce by half. In a large skillet, add butter and bring to medium heat. Then add the chopped mushrooms, onion, bell pepper, jalapeno and salt. Cook for 6-8 minutes or until vegetables are tender, stirring occasionally. During the last minute, add the chopped garlic. While vegetables are cooking, whisk the arrowroot powder into the chicken stock and set aside. Once vegetables are tender, lower heat to medium-low and add the arrowroot and stock mixture. Stir mixture and then stir in the chicken, half of the cheddar cheese, all of Parmesan cheese, Cajun Seasoning and spaghetti squash. Stir well and then taste for seasoning and adjust if needed. Turn off heat. Sprinkle the remaining cheese on top of the the meat and spaghetti squash mixture or pour the meat and spaghetti mixture into a casserole dish and top with remaining cheese. Broil for 5 minutes or until cheese has melted and slightly browned. Serve with my Better Than Red Lobster Biscuits! This looks like tomorrow night’s supper! 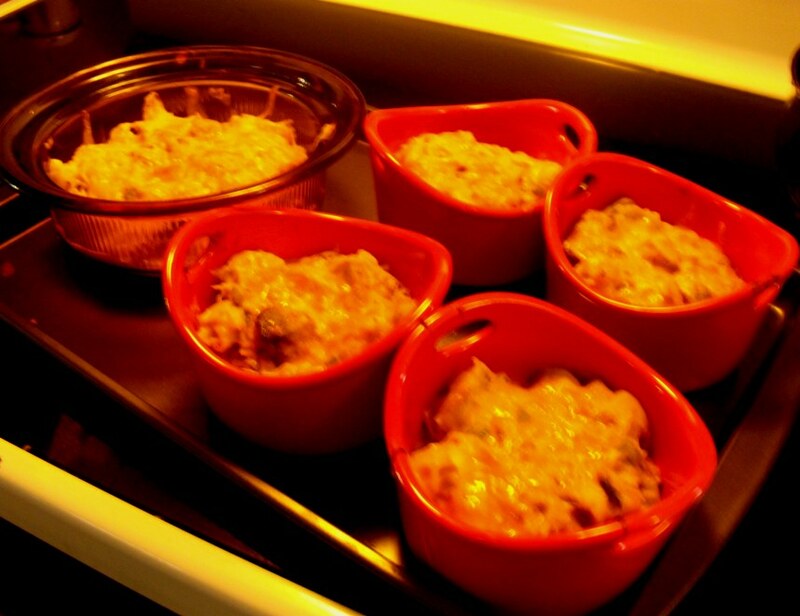 You’ve done it again, Melissa – tempted my taste buds with another yummy recipe!!! My guys would LOVE this! 😀 I have some andouille sausage that I got from the farmer’s market… I think it must go in this recipe! What’s the best way I might incorporate it? Thanks for the recipe! Can’t wait to try!!! This looks fantastic – we can’t get spaghetti squash here in the UK, can you suggest anything else that would be just as yummy for the ‘spaghetti’? I have a spiral slicer and have done zoodles in the past, just wondering if they’d not have enough flavour for this recipe and if something else would work better. Erika, you could try the zoodles but I haven’t tried this modification. The spaghetti squash really doesn’t impart flavor but just a vehicle for all of the other yumminess! If you do, please let me know! Yum, Yum, Yum! Absolutely delicious!!! I made 4 single servings in ramekins and a double serving for my husband. He gobbled it up and I have three servings to put in the freezer! Very easy and quick to put together.